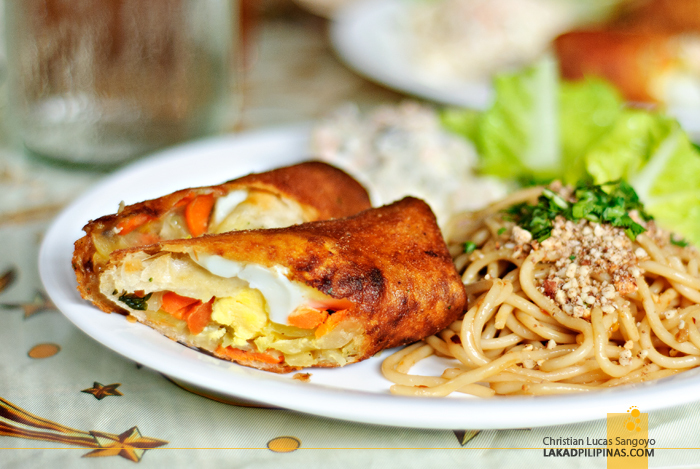 A huge plate filled with pasta, spring rolls, veggies and salad was laid down on our star-spangled table. Everything looked familiar, but not quite. Before our host left, I quickly asked her for the name of the dish. She turned back, smiled and said, I usually serve this at home and I haven’t even thought about giving it a name just yet. It was our first stop for Pampanga’s giant lantern tour and we were at Nona’s Kitchen. Well, we really don’t get to see the lanterns at their grandest and brightest since it was still a week before they were to be unveiled, but what we were here for was to see how they’re made. And yeah, we’re here to eat. 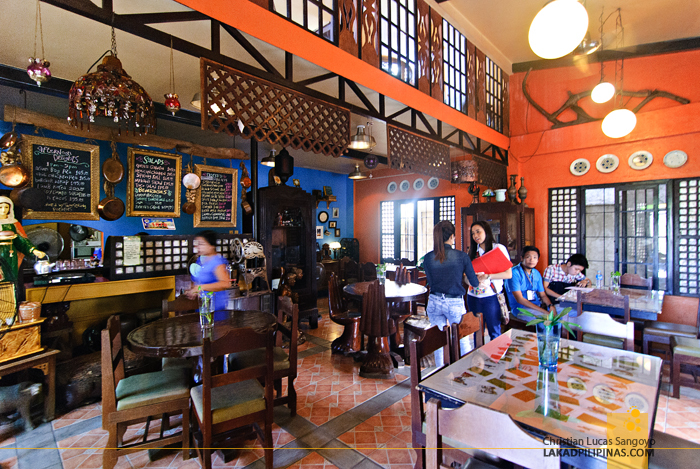 A tour of San Fernando City wouldn’t be complete without a culinary adventure. 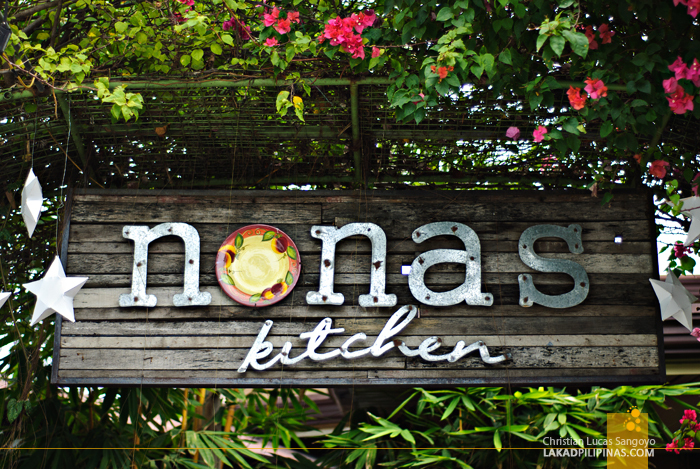 Nona’s Kitchen is one of the newest food joints in Pampanga. It’s manned by the mother and daughter-in-law tandem of Bernardita Mercado and Leah Gallardo. Curiously, the restaurant’s name came from the former’s grandchild who can’t seem to pronounce lola correctly. 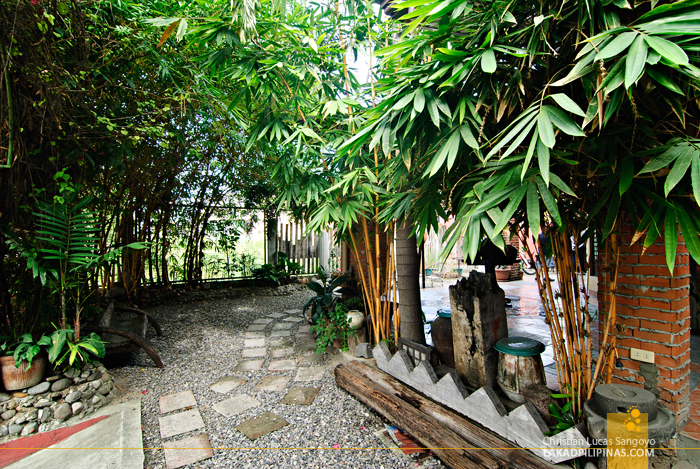 The place is set in a lush garden and looks very much like your grandma’s home. 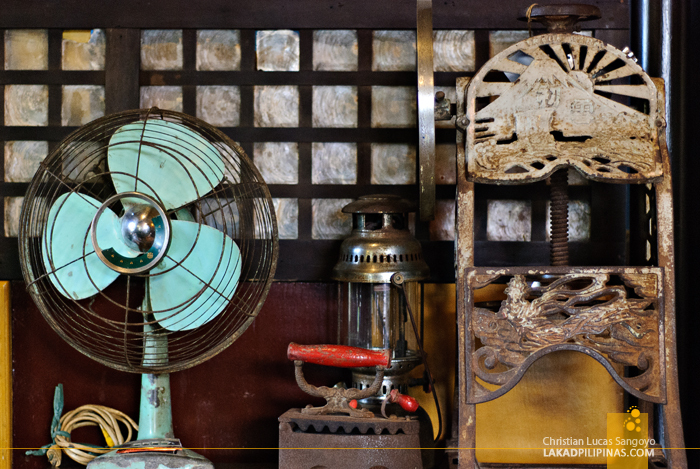 Old knick-knacks and what-nots decorate the corners of the open-aired villa together with statuettes of saints and reused capiz windows. 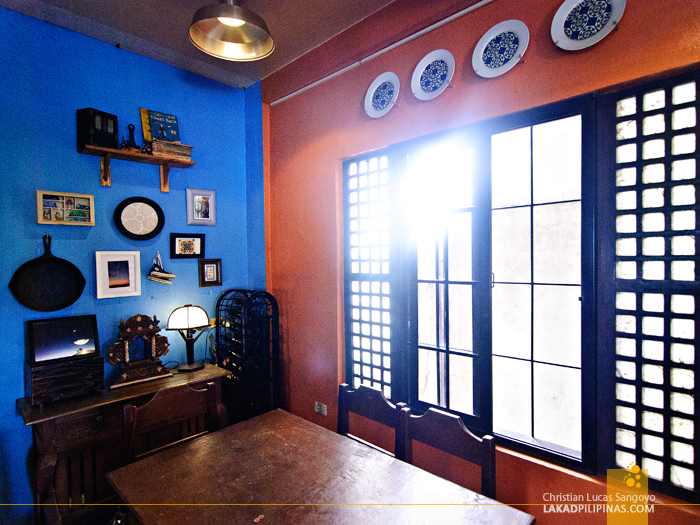 It sort of reminds me of Casa San Pablo in Laguna, only much smaller in scale. Its interior is a bit cramped but the numerous al fresco seats outside make up for it. One of our companions asked if they have plans on air-conditioning the whole place. Definitely not was their reply. We wanted the place to have that indoors-outdoors feel and closing the place up with glass would take that away. I agree with them. 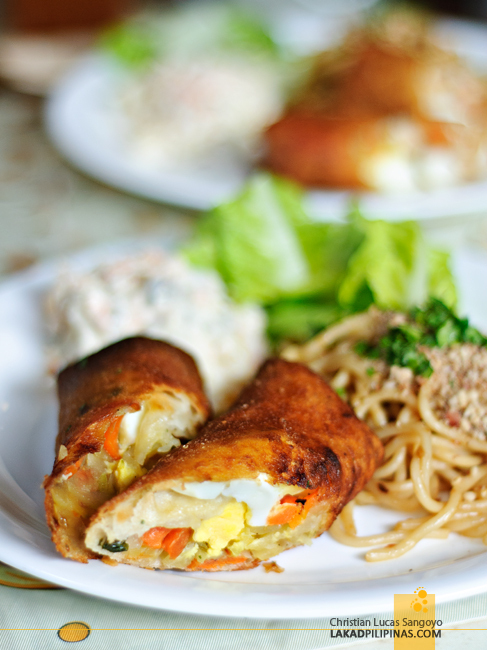 Surprisingly, the menu of Nona’s Kitchen doesn’t have the usual Kapampangan dishes. 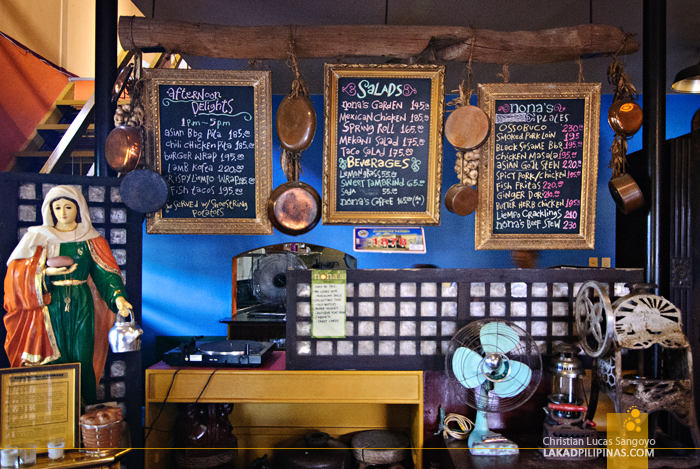 Instead of finding sisig, biringhe and other traditional Pampangeño food, you’d find lamb kofta, chicken masala, ossobuco and other strange-sounding Asian dishes colorfully scribbled across their blackboard menu. They said that every restaurant in Pampanga is already serving those and they wanted to give their patrons something much more unique. After glasses of cold lemongrass drinks, our still unnamed breakfast arrived; the pasta is made from spaghetti and has that pad thai feel to it, the spring rolls are Vietnamese-inspired and the potato salad is infused with pink salmons. 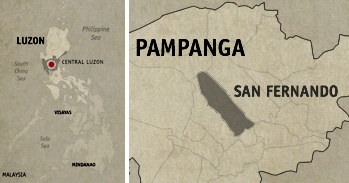 It’s quite a unique menagerie coming from a Kapampangan restaurant. And the taste? It was as good and interesting as it looked. If our visit to Nona’s Kitchen was to be an indication for how the rest of our day was gonna be in the city of San Fernando in Pampanga, then I’d bet that it would be as interesting as this restaurant’s culinary servings. Now were ready to see them giant lanterns. That's my classmate, Lejah. Good job, Lej! And yeah her restaurant's menu also surprised me a bit kasi I was expecting Kapampangan dishes pero she tries to veer away from that maybe to complement the eclectic atmosphere of Nona's. Just a walking distance from our office.I enjoyed their dishes, cooked with love. i loved also the tamarind iced tea.and of course the a service is so warm with a lot of chichat from the couple.